I have this strange fear of any recipe that involves cooking and wrapping food. I’m not talking about burritos, but recipes that involve a lot of rolling or wrapping. I had to psych myself up before making spring rolls for the first time, pot stickers seemed over-the-top hard (it was the pleats), ravioli (uh, ridiculously easy come to find out) and sushi (which I admit even after making it still slightly intimidates me). 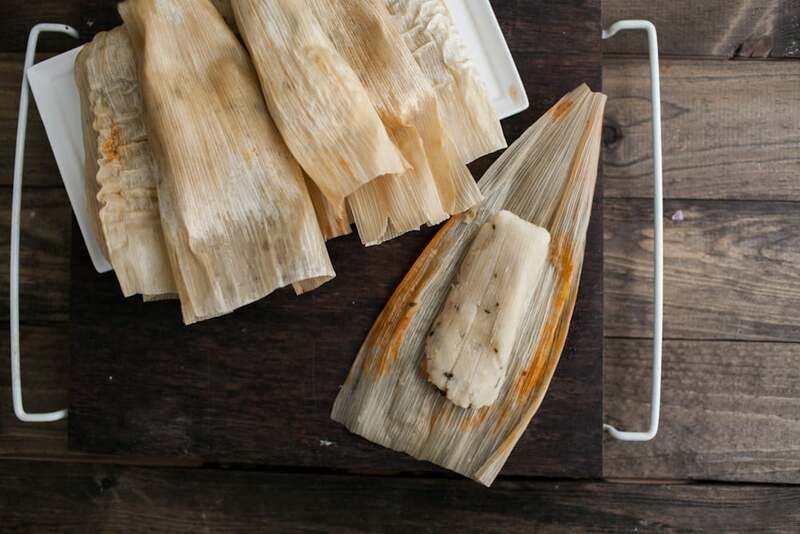 Here’s what I found out: tamales are ridiculously easy. There isn’t a lot of hands-on time, the wrapping stage is quite easy and not near as tedious as pleating 50+ potstickers, and there is no need for perfection. Even if the tamales come out ridiculously messy, it’s okay- they still taste great. The list of ingredients is long, this is true. However, many of the ingredients I had in my house already. In fact, the corn husks were the only thing I didn’t have in the house which I found at a local Latin Grocery Store (however, you can also order them online). I also buy a big bag of masa to keep around for making corn tortillas. Mix together masa, salt, oregano, and baking powder in a medium size bowl. Melt coconut oil and pour over masa along with warm water. Mix until dough forms, adding a 2-3 more tablespoons of water if dough seems too dry. Cover and set aside. Separate corn husk and cover with hot water, placing a heavy object on top if needed to keep husk submerged. Let sit until ready to fill. In a large skillet, heat one tablespoon of olive oil over medium-low heat. Add in onion and cook for 4-5 minutes. 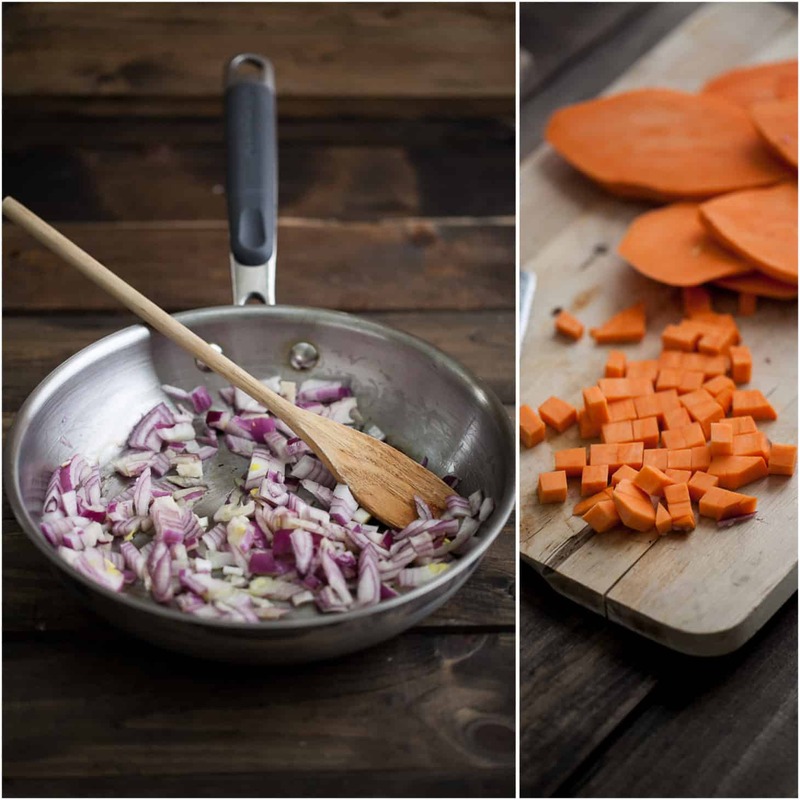 Cut sweet potatoes into 1/4″ cubes and add to pan along with chipotle peppers, adobo sauce, and lime juice.. Cook for 2-3 minutes. Next, stir in black beans along with liquid and salt. 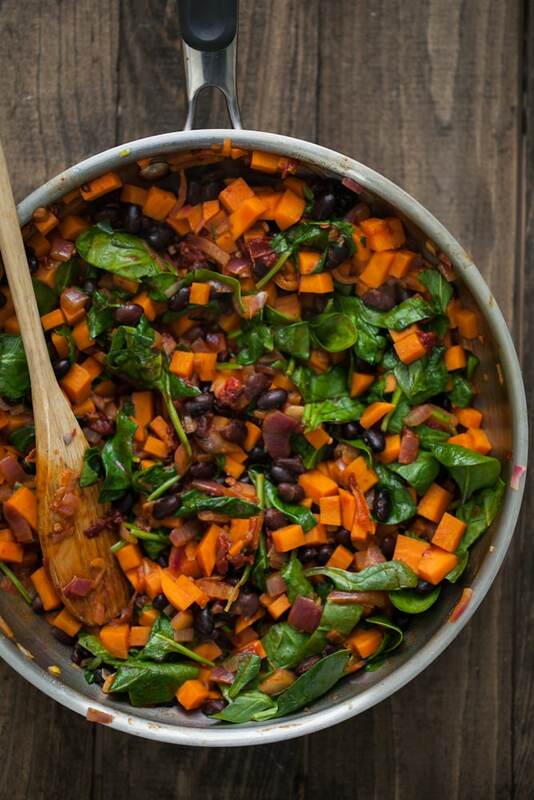 Leave uncovered and cook until sweet potatoes are tender and liquid has almost fully absorbed. If sweet potatoes are not done and liquid is gone, add a bit of water or veggie broth. Chop spinach and cilantro, adding it at the very end. Remove from heat and stir until spinach has wilted. Fold up sides so that dough is completely covering the filling. Fold the right side over the left side and then fold of the end. Place seem side down on a platter and repeat with remaining dough and filling. Place a steamer basket in a large stock pan and add enough water to steam. Place tamales inside, seam side down. Cook for 45 minutes. While tamales cook, heat 1 tablespoon olive oil in a medium pot. Mince garlic and add to pan, cooking for one minute. Add in tomato sauce, chipotle peppers, adobo sauce, and salt. Bring to a boil, reduce to a simmer, and cook until peppers are broken down, 10-15 minutes. Remove from heat and stir in cilantro. 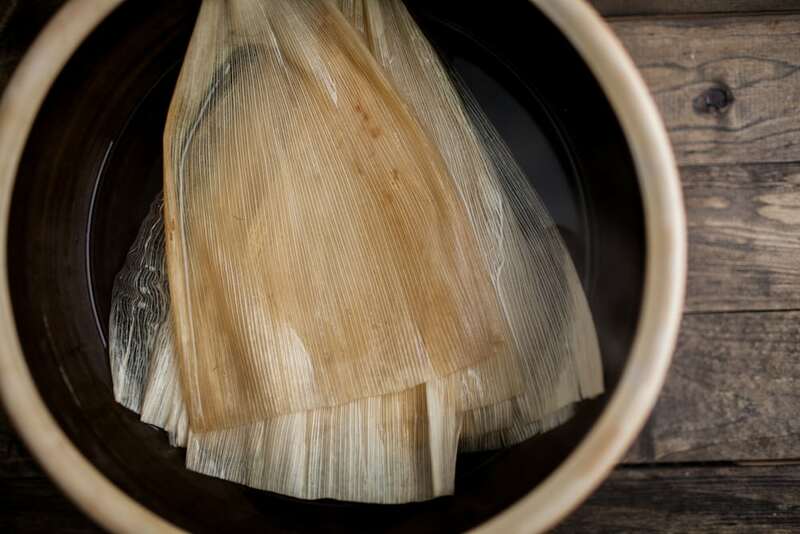 Once tamales are done, unwrap and serve with sauce. *Tamales freeze really well and can be reheat by microwaving/steaming again. *This recipe is adapted from Happyolks. 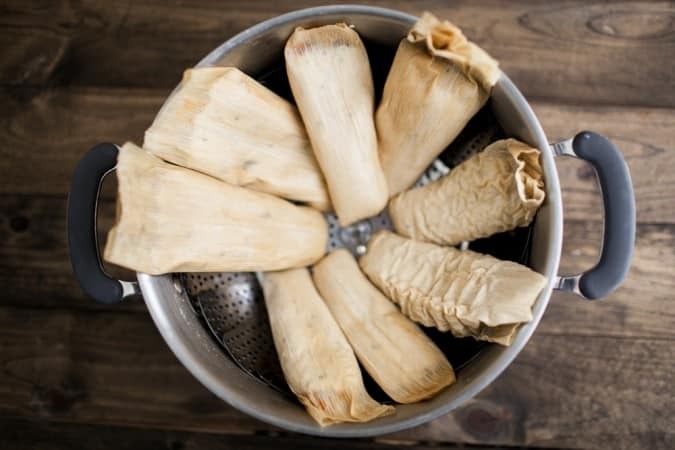 If you need more ideas of ways to cook the tamales, Kelsey gives you a few! Also be sure to check out her filling too! Those look delicious! I get sick of tamales with so much meat and yours look perfect! I too am afraid of rolling food. wonder where that comes from. Wow, Erin! These look delicious! Tamales are something I’ve definitely always wanted to make, but am a bit intimidated by. You make it look simple enough! Not to mention really freaking delicious… Thanks for the recipe! I love tamales!!! I normally like to get them from one of my brother’s Mexican co-workers, because I am scared to try the process. But you make it look so easy! I already have Masa on hand for papusas so I just need some corn husks. Thanks for the inspiration! The filling looks delicious! I’m quite impressed by this recipe. It makes me want to try to make my own tamales (not to mention ravioli and sushi)! So fun! This is such a cool idea! Homemade tamales? OH MAN. This is going to have to happen very soon indeed. The filling sounds like the perfect blend of sweet and spicy and green! I am SOOO excited about this recipe!! 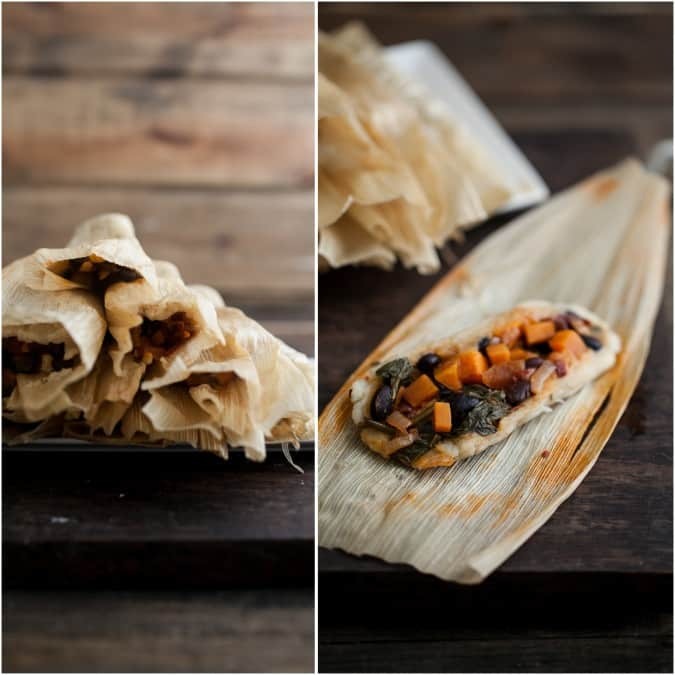 A creative take on tamales. I have renewed respect for anyone who makes food that requires wrapping. I have no skills in that department. I used to make tamales with the kids at this community food centre I volunteered at. A bunch of little hands makes quick work! It does seem super multi-step/intimidating at first though. SO glad you got over that fear and just owned it because these look superb, Erin! Also loving your coconut oil inclusion in the dough. Trying that real soon. Oh my goodness, we must make these NOW! 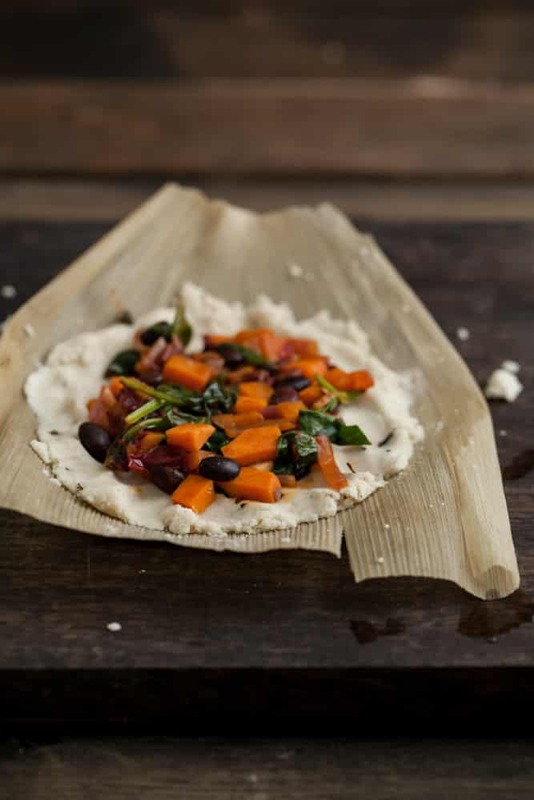 I’ve never tried homemade tamales, but these look amazing! We’re eating similarly!! I made burritos using the exact same ingredients last week! Thanks for this recipe! My tamales didn’t turn out as pretty looking as yours but they sure were YUMMY! 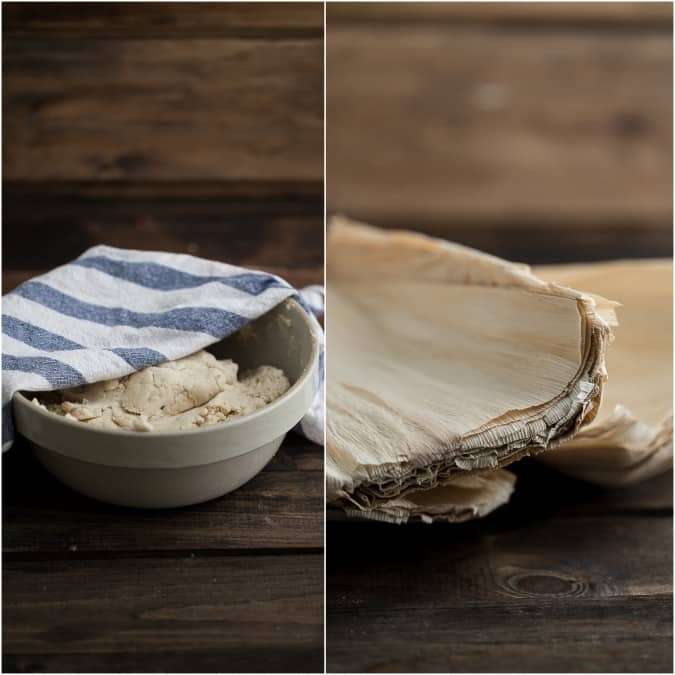 I’ve had this notion that tamales are hard to make, wrong…… This has opened up my mind for different variations of tamales. Wonderful, Melissa! I didn’t think mine were very pretty either but they sure are delicious 🙂 I’d love to hear what variations you try! ahh I’ve been dying to make tamales. Will try it out! I finally made these and they were so so good! I can’t believe it took me over a year to make them. I am vegan and love tamales, but almost never am able to eat them out because they pretty much always have cheese. These were such a treat and so easy to make! I was worried it would be difficult, but it just required some time. Thanks so much for the wonderful recipe!